Sir Paul McCartney and his wife, Heather Mills have said they have "good news" in their first public appearance since announcing they were expecting a baby. At a concert attended by 12,000 fans in Sheffield, Sir Paul played one of his newer songs for her and said: "We've got some good news now." Earlier the couple had posed for the cameras, with the former Beatle joking: "I can't think why you want a picture." Fans hoping to learn more about their first child were left guessing though, as he said: "We're not doing any talking." Sir Paul's Sheffield concert was the penultimate date in his Back in the World tour. It had been supposed to take place in April, but a bad throat forced him to rearrange. Outside the Sheffield Arena, many fans were eager to congratulate the father-to-be. Pam Walker, 38, from Portland, Maine, USA, said: "I'm so excited for them. It's wonderful and I think he'll make a great dad. He's great with kids." Hiroko Ito, 40, from Tokyo, said: "I'm his number one fan. I think he's amazing. I'm so pleased for them." The 60-year-old singer and his wife married in Ireland in June 2002. 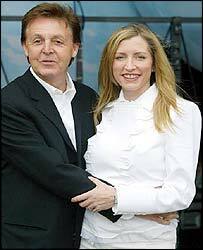 Their baby will be Heather Mills' first child, but the fifth for Sir Paul. He is already father to Mary, 33, Stella, 31, and James, 25, and stepfather to Heather, 39, all by his first wife, Linda. The couple said they were "delighted with the news".